The MLS Superdraft takes place next week and the candidates are down at the South Florida Combine, playing some games and trying to impress. Not knowing anything about those guys, I was very interested in the Overall Rankings list, from Pro Player Pipeline, of all the players on offer. The MLS site also gives us this list of 10 Seniors to watch. The Red Bulls have been loosely linked with a few of those players, through various Mock Drafts, in the last couple of weeks. In his first 2011 Mock Draft, Ives Galarcep had RBNY picking North Carolina Midfielder Michael Farfan with the 13th pick. In his latest Mock Draft, Ives has RBNY picking UCSB Left Back Michael Tetteh. Ives also suggests, in both Mock Drafts, that the Red Bulls could also be tempted to bypass both players and pick Michigan Forward Justin Meram. As Matt infomed us on his Kassel post, the bloggers over @SB Nation got together, this past Tuesday, and picked a full two rounds worth of players in their 2011 Mock Draft. Ben Schneider, of Once A Metro fame, had RBNY picking North Carolina Center Back Jalil Anibaba at #13, Akron Left Back Chris Korb at #25 and Southern Methodist Midfielder Josue Soto at #30. The experts over at MLSsoccer.com also held their own mock draft this past week. The three editors involved picked Akron Midfielder Michael Nanchoff, Michigan Forward Justin Meram and Akron Midfielder Anthony Ampaipitakwong. It's interesting that Meram's name keeps popping up again and again, but that just probably means the Red Bulls will NOT pick him. Let's see what happens on Thursday. Getting back to Matt Kassel: We all know that as a Homegrown Player, he can sign directly with the Red Bulls, bypassing the draft comepletely. Better still, his salary won't count on our team's cap. Which leads us to the several Generation Adidas players on offer, whose salaries will also not count agains the cap. The Red Bulls, however, will probably not have a high enough pick to select one of the top GA players. Red Bulls Defensive Midfielder Rafa Marquez has taken a cue from Thierry Henry and bought himself a very expensive Manhattan Loft. At $6.4mil, it's roughly half what TH14 paid for his place. Still, I'm betting that it's expensive enough to keep Rafa's super hot model girlfriend very happy. Red Bulls Midfielder Tony Tchani, along with several other young MLS players, is on the USMNT radar. Tchani can apply for citizenship next year but who knows how long that process will take. We can only hope he can be patient, as he's shaping up to be a monster of a player. The Hans Backe Viking Army invaded Newark's Prudential Center for a NJ Devils game. A great way to kill some off-season time! 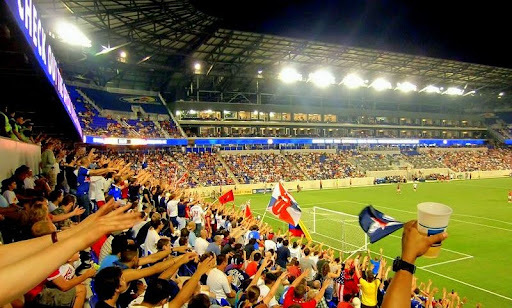 The USMNT will play a friendly, against Argentina, at the New Meadowlands stadium on March 26th. Looking for a part-time job this year? Well, Red Bull Arena food service is hiring! That's all for now. Viper Out!